Friends of Groasis holds 5% of the share capital of Groasis and has limited liability. Friends of Groasis is also registered at the Dutch Chamber of Commerce. The speaking right and the profit distribution are proportional to the value (price) of the shares. You can find the difference between the various shares below. The price per Sustainable share is €1,500. The shares are freely transferable. For each purchased share we donate, on your behalf, 10 Growboxxes to 1 family. This includes trees, vegetables and Growsafe tree protector. The price per Green share is €7,500. The shares are freely transferable. For each purchased share we donate, on your behalf, 70 Growboxxes to 7 families. This includes trees, vegetables and Growsafe tree protectors. The price per Silver share is €15,000. The shares are freely transferable. For each purchased share we donate, on your behalf, 150 Growboxxes to 15 families. This includes trees, vegetables and Growsafe tree protectors. The price per Gold share is €37,500. The shares are freely transferable. For each purchased share we donate, on your behalf, 370 Growboxxes to 37 families. This includes trees, vegetables and Growsafe tree protectors. The price per Platinum share is €75,000. The shares are freely transferable. For each purchased share we donate, on your behalf, 750 Growboxxes to 75 families. This includes trees, vegetables and Growsafe tree protectors. Note: Groasis is currently working hard to organize the first plant project where the Growboxxes are donated to various families. We need to wait until we have a large number of Growboxxes that allow us to minimalize the organizational and transport costs. We are also busy selecting a village (most likely in the Middle East) where we can help rural families. 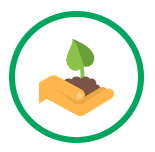 We hope that in the spring of 2020, we can plant your tree. We keep you informed! You can use various payment options with us. The first option is to pay the shares in one go. You can also opt for an automatic collection which is divided over 10 months. The notary and processing fee is € 200. If you choose to pay the share / shares in one go, you will receive a 50% discount on this fee. View the table below to see what the one-off or monthly costs include the fee. When purchasing multiple shares during the same transaction, the fees only have to be paid once and the amount will deviate from the table below. If you are interested in this, we ask you to contact us so that we can calculate the right price for you. * Calculation errors are reserved. Since the first issue of the shares in 2016, the value has increased by 50%! Please note: Shares represent part of the ownership in the company. If the company does well and makes a profit, the value of the shares can rise. If the company does not do well and makes a loss, the value of the shares will fall. The profit or loss of the company depends on many circumstances. Think of the management quality, the global economy, the request for the solution offered by Groasis, etc. It is up to you to decide how to assess the market. Taking into account circumstances such as food scarcity, climate change, population growth, degradation of the soil, etc. We advise you to form your own vision of Groasis’s opportunities in the market before making a purchasing decision. Performance of the shares in the past does not guarantee future price increases. Therefore, Friends of Groasis is not liable for the increase or decrease of the value of the offered shares. Are you interested in one of the shares of Friends of Groasis? Click on the button below. All requests are processed on the basis of the time of the application. If no more shares are available, you will receive a message about this.